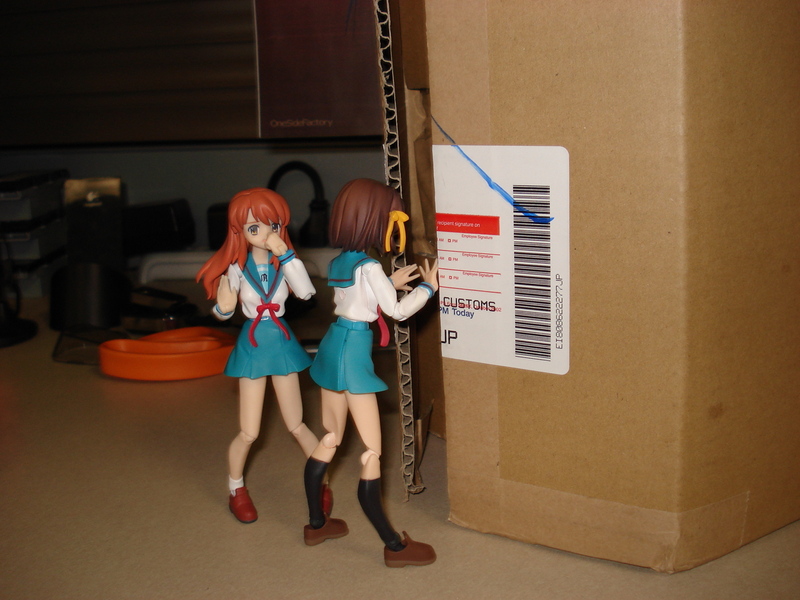 Mikuru: Suzumiya-san, what are you doing? 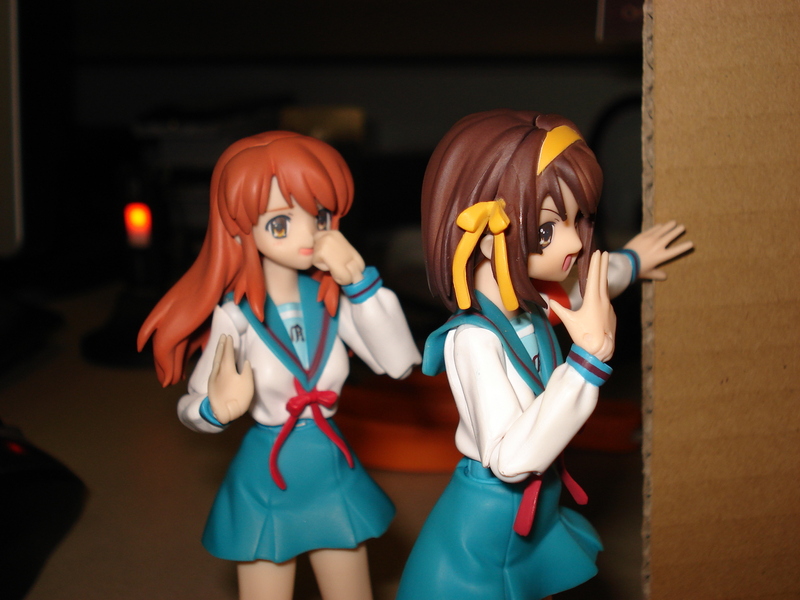 Haruhi: Checking it out of course, Mikuru-chan! And you’re coming with me! Mikuru: What do you see? 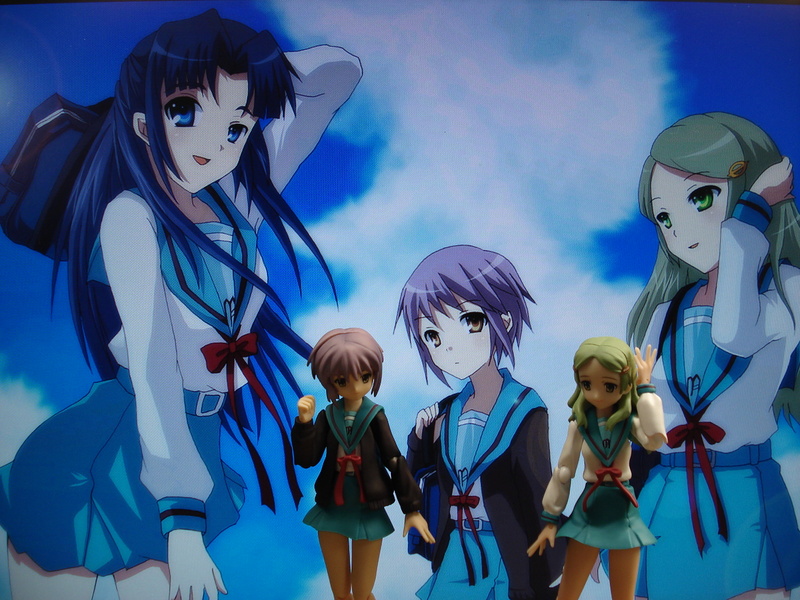 Haruhi: I can’t believe it! It’s incredible! Mikuru: Suzumiya-san! Please be careful! If you haven’t been able to tell by now after that elaborate little story, my figma Tsuruya-san has arrived, and this is the review for her! 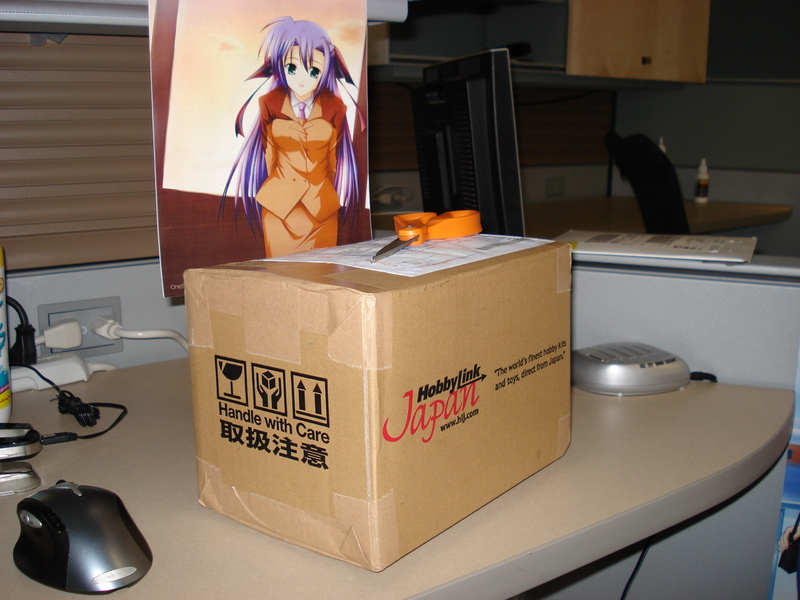 Included with the figure is the usual set of figma goodies. The bag and stand, set of hands and extra face. 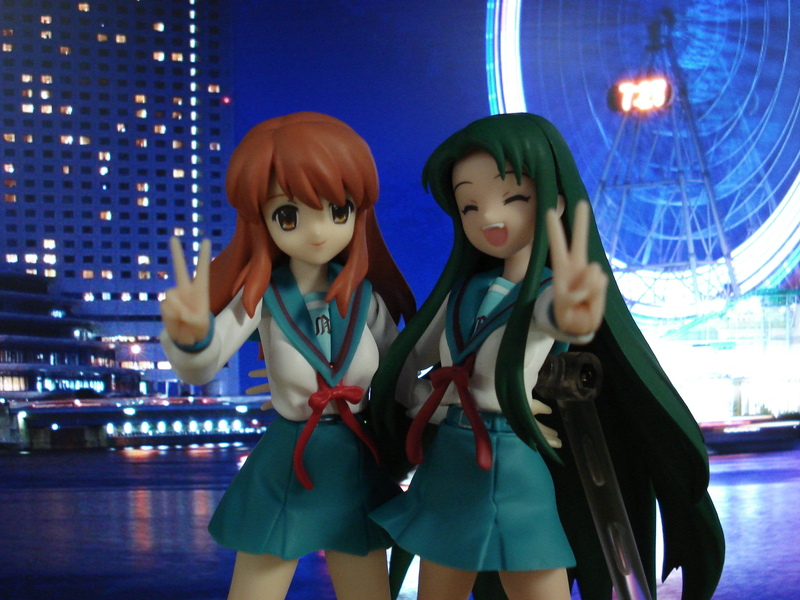 Tsuruya-san’s extra face is a smiling face like Kagami~n’s (by the way, congratulations are overdue for Kagami and Tsukasa for winning 1st and 2nd place in the SaiMoe tournament for 2008! Omedetou!) but a little smaller. Strangely, she does not come with a set of indoor shoes like I expected, but she gets something even better; a set of hands in the ‘v’ sign position (also known as the peace sign in the states.) 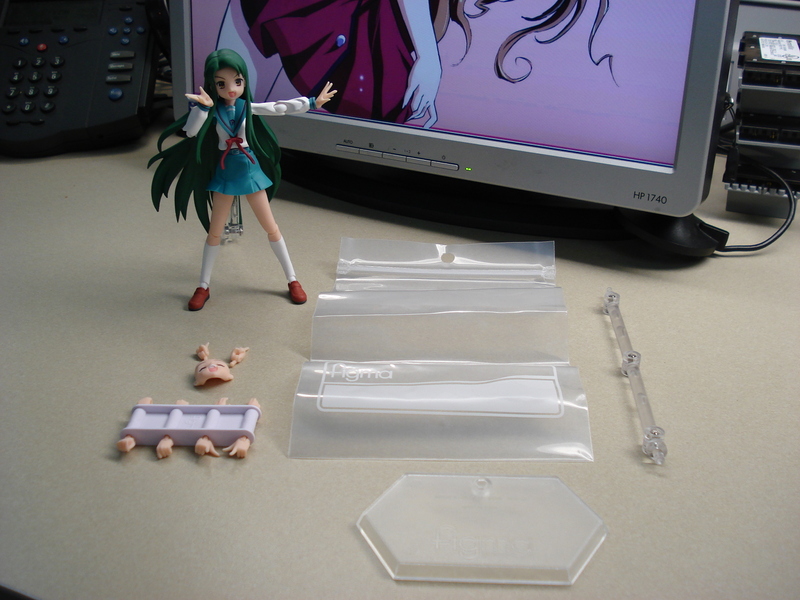 As with all figma hands, these can be used with most of the other figma as well, making special poses available. 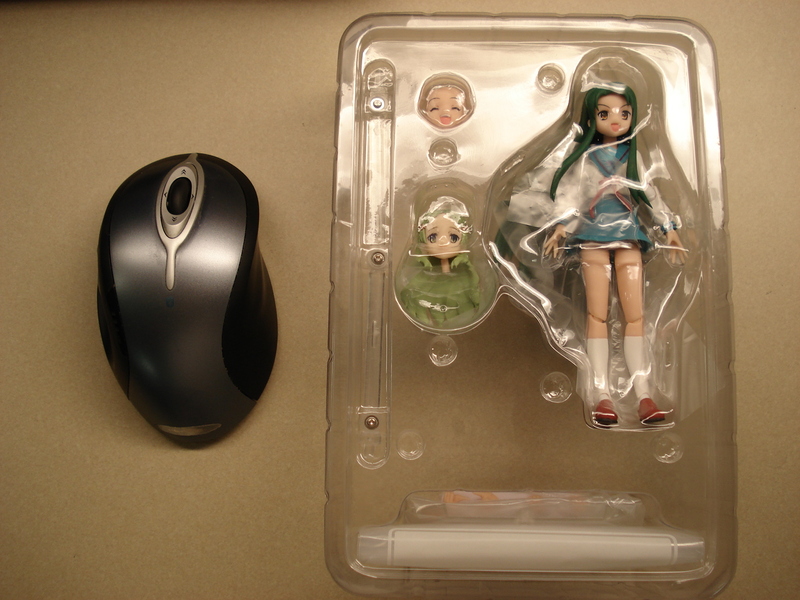 Finally, as the gold foil sticker on the box mentions, Tsuruya-san’s figma comes with a bonus part which you can clearly see in the package; a Kimidori Emiri replacement head! 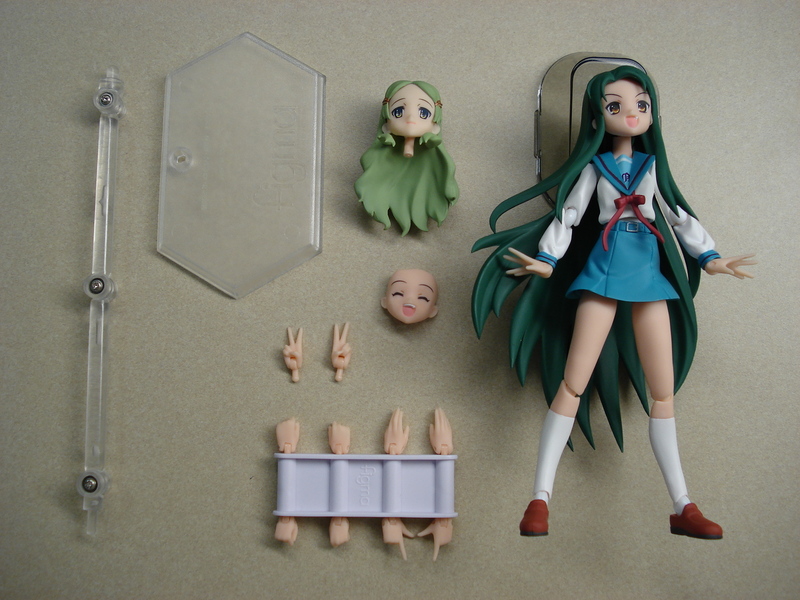 Here is a picture of Kimidori’s head on the Tsuruya-san body. I can’t remember if she is a second year or not, but I wager if not, you can headswap her onto the Evil Witch Nagato body, since Kimidori isn’t seen wearing a cardigan. I believe most of the bodytypes are the same though. 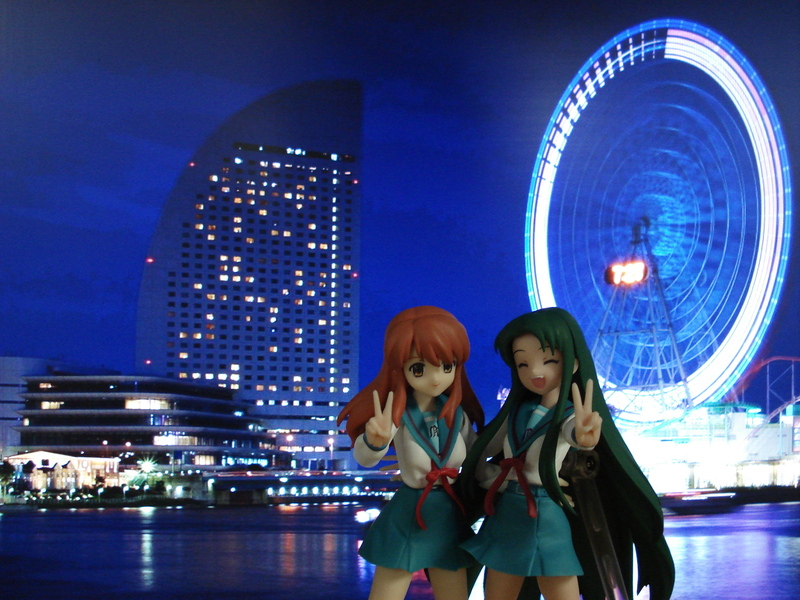 I snapped a few LCD screen pics with Tsuruya and Mikuru. Here’s one of the better ones. It doesn’t get much better than this figma. 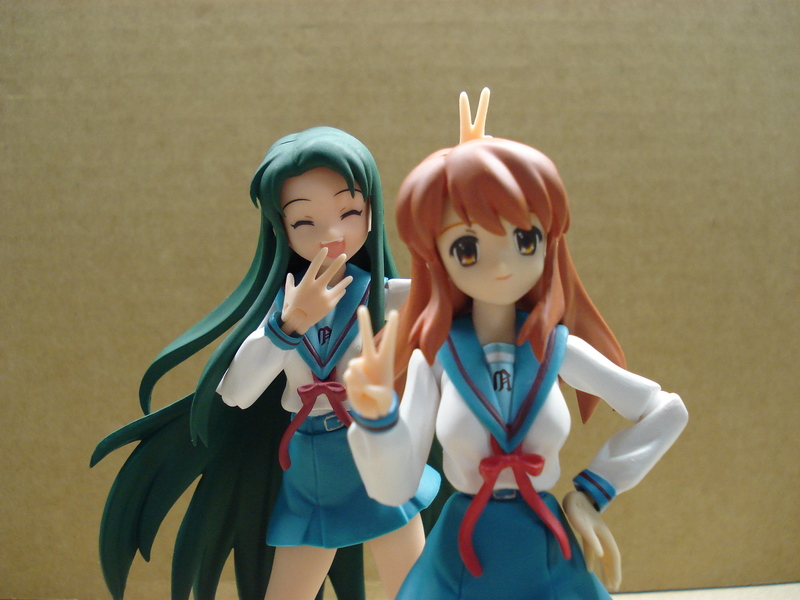 Tsuruya-san is my abosulte favorite character in the series, so naturally she was a must buy for me. 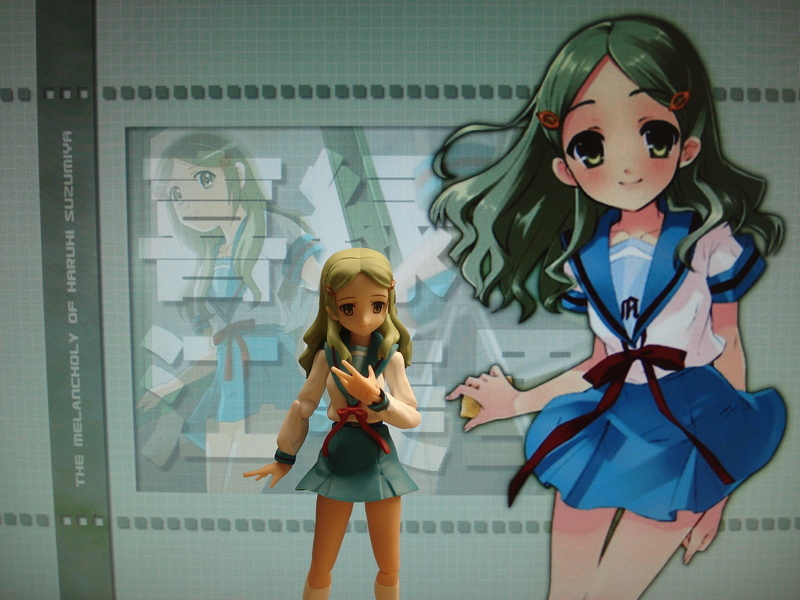 Since she comes with the Kimidori head, this purchase is essentially a 2 for 1 buy. I highly recommend her as a purchase to add to your collection. You can find her at most online stores for between $25-30 before shipping. Nyoro~n! Those pics with city wallpaper look great. It’s a really good way to use monitor as background. 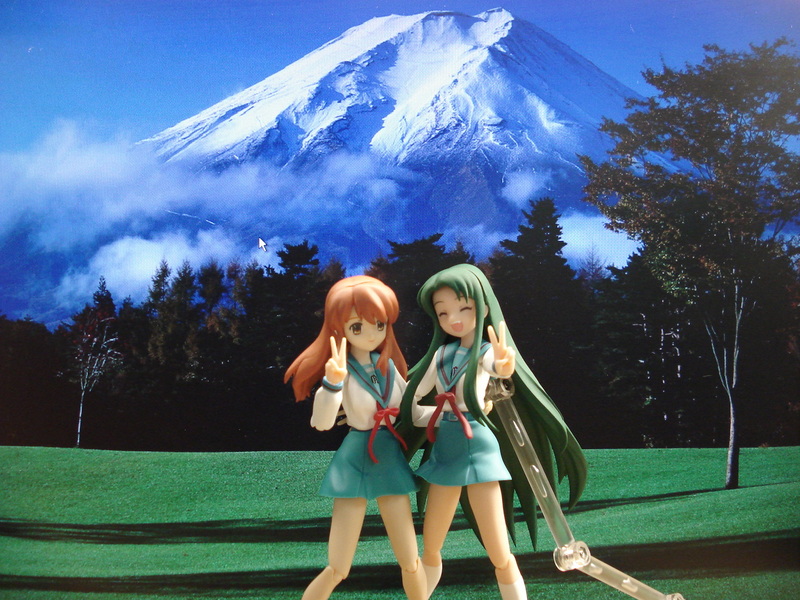 I like your shots which highlight the value figmas, beautiful collection. 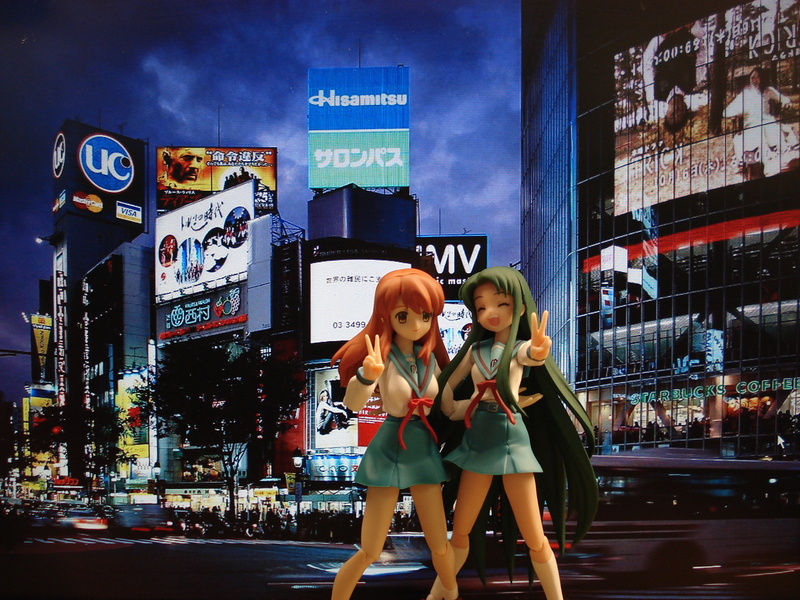 Miku is very pleased to find Tsuruya san! @Death: HLJ’s website is in english, same as Hobby Search. 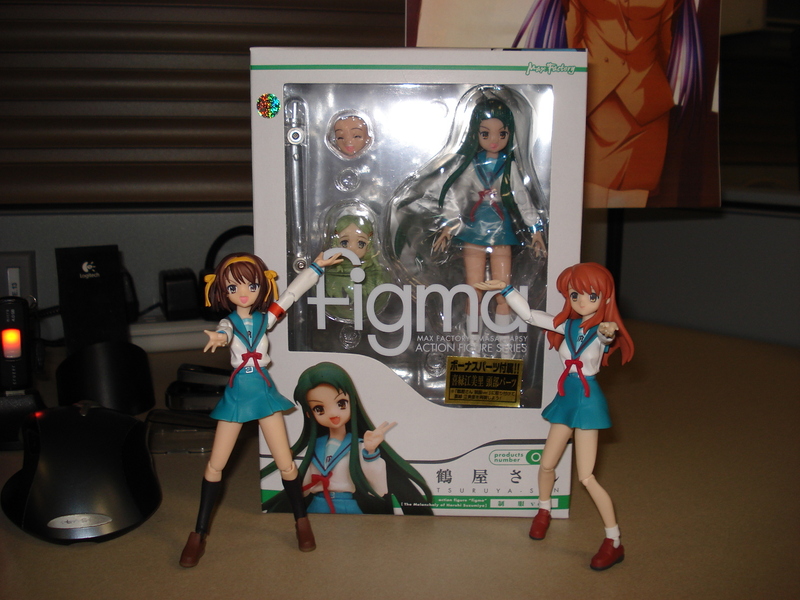 Lol, judging for your blog, you really, really like Figma, don’t you? I like them, aside from the fact that the joints are too noticeable. How are you able to order in Hobby Link Japan?